The perfect summer salad doesn't get any easier than this Tomato Avocado Cucumber Salad - made with only 4 simple ingredients and a flavorful red wine vinaigrette! This is an easy salad that comes together so quickly and always a crowd favorite. Its healthy and packed with energy-boosting Vitamin C from the tomatoes! Who said salads need lettuce? They don’t! I love throwing together simple quick salads like this Tomato Avocado Cucumber Salad. There is some chopping required to get everything perfectly bite-sized (and kid-sized) for this tomato avocado cucumber salad. But hey, just whip out whatever Netflix show you’re currently binge watching, chop up the heirloom tomatoes, cucumbers, onion and avocado and toss them all in the world’s easiest salad dressing made with only olive oil and red wine vinegar. Ok, you’ll also need salt and pepper, but that’s always a given. And just like that…you’ve consumed 10 extra minutes of your latest Netflix affliction (oh wait, you watched more than 10 minutes after you finished chopping, didn’t you?!) and made the best summer salad ever. Now you can enjoy your creation…and continue watching your show because you saved time not having to wash and chop lettuce! You’re welcome. 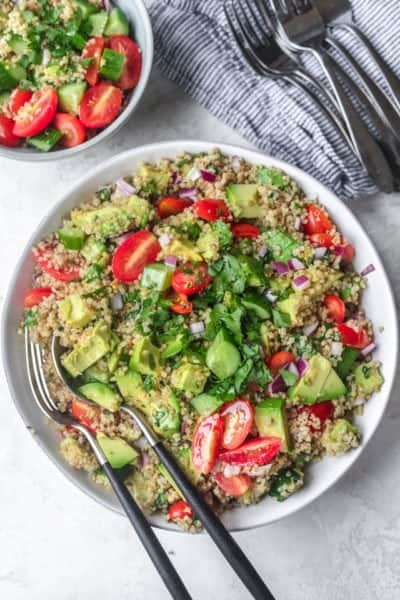 If you’ve tried this healthy-ish feel good Tomato Avocado Cucumber Salad recipe or any other recipe on FeelGoodFoodie, then don’t forget to rate the recipe and leave me a comment below! I would love to hear about your experience making it. And if you snapped some shots of it, share it with me on Instagram so I can repost on my stories! 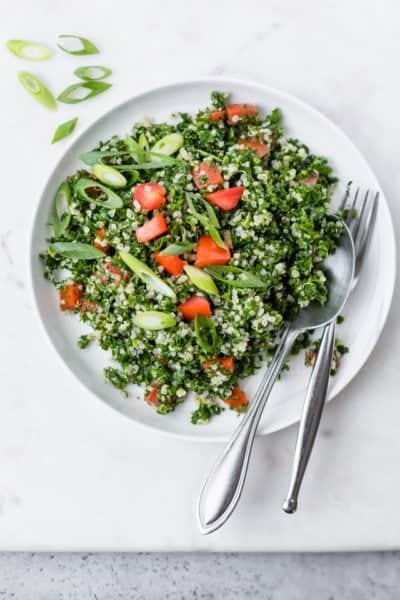 In a large bowl, whisk the salad dressing ingredients - olive oil, red wine vinegar, kosher salt and fresh cracked black pepper - until well incorporated. Add the tomatoes, cucumbers, onion and avocado to the large bowl of dressing. Using a small spoon, slowly mix the salad until it is well coated without mashing the avocados. Make Ahead: You can make the dressing up to 7 days in advance and you can prepare most of the salad up to 1 day in advance. Just add the avocados and the dressing when you’re ready to toss it. Storage: Store any leftovers in an airtight container for no more than 2 days since the avocado will brown by then.